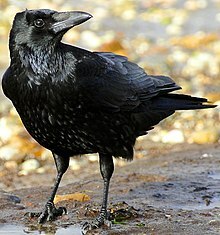 This article is about bird species with the word "crow" in their common name. For the genus containing crows, see Corvus. For the family containing crows, see Corvidae. For other uses, see Crow (disambiguation). A carrion crow scavenging on a beach in Dorset, England.